Blur Busters Forums • View topic - Strobe Utility 2.0 BETA Download! Strobe Utility 2.0 BETA Download! Re: Strobe Utility 2.0 BETA Download! whitestar wrote: Excellent work, thank you very much! Works beautifully on my 3 XL2720 monitors (one XL2720Z and two Zowie XL2720). You are very welcome! Thank you for this report. I bet that the new built-in TestUFO makes it much easier for you -- it automatically moves & maximizes the TestUFO motion test to cover the full screen of the correct monitor -- everytime you select the monitor that you wish to adjust. Hi, I really like what you guys are doing at BB, really great. I am using a xl2730z but I always seem to get crosstalk when enabling strobe. Running 60hz desktop on r9 270x through hdmi 2.0 that can go up to 120hz in games. RamenRider wrote: Hi, I really like what you guys are doing at BB, really great. 2. Always run console games at 60fps. Also, consoles currently do not support large vertical totals, so you will still get more crosstalk at top/bottom edge. 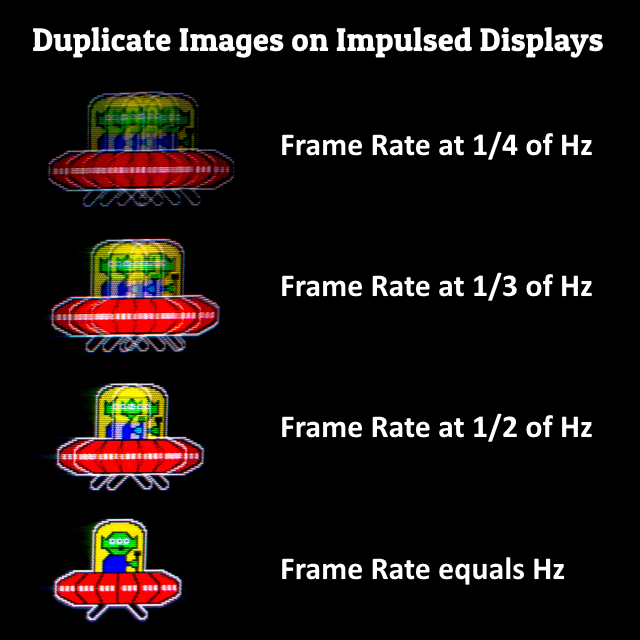 Remember that low-framerate double image effects aren't the same thing as strobe crosstalk. Once your frame rate matches Hz, you will have virtually zero crosstalk for screen center, but minor crosstalk for top/bottom. You'll probably have thicker crosstalk bars for consoles than with PC, because consoles don't currently support system-side long blanking intervals -- which tends to help these BenQ Zowie monitors particularly well. So framerate is probably half of hz because it looks like that example. How do I double the framerate of Strobe Utility? Either that or I am not sure what hz the program is using, May even be 120 because SU2.0 is fullscreen. But I would rather double the framerates just for full functionality's sake. RamenRider wrote: So framerate is probably half of hz because it looks like that example. How do I double the framerate of Strobe Utility? That's the game's responsibility. Make sure you're running at 60fps instead of 30fps. Strobe Utility can only halve the strobe rate of 60Hz on certain BenQ Zowie monitors. Are you able to test with http://www.testufo.com first before testing with a console? Please adjust with that first. RamenRider wrote: Either that or I am not sure what hz the program is using, May even be 120 because SU2.0 is fullscreen. But I would rather double the framerates just for full functionality's sake. If you don't know what the Hz you are using, we can't know how to double the framerate yet. We need "Framerate equals Hz". But if you're using a console -- then you want to calibrate with 60Hz. Have you enabled the "single-strobe" feature? Do you see the number of images halve when you turn on/off "Enable Strobe" while running Windows while Windows is running 60Hz? You must calibrate at 60Hz using Windows before switching the video to the console. Otherwise the adjustments don't transfer over. Temporarily set Windows to 60Hz (you must definitively know first), then adjust with Strobe Utility until the UFOs look good, then switch to console. I checked desktop settings and radeon settings, my desktop is definitely 60hz. SU2.0 is running 60fps, and says the monitor is running 60hz. So enabling blur reduction is exactly the same as turning blur reduction on, however the 2 adjustments do not seem to affect anything. Could it be my firmware version? I assume it is V2 cause it was refurbished June 2015. And by enabling strobe, I actually meant checking the blur reductions checkbox. RamenRider wrote: I checked desktop settings and radeon settings, my desktop is definitely 60hz. SU2.0 is running 60fps, and says the monitor is running 60hz. You need to also enable blur reduction via monitor menus too, before enabling via Strobe Utility. You need to turn on blur reduction in both the monitor menus AND the Strobe Utility, in order to get single-strobe 60Hz working for consoles. I see some posts from a few years ago that say a later strobe phase of 100 has no input lag where earlier 0 has 1 frame. earliers seems like it would have less lag so im wondering if that was a bug, what settings has zero input lag? 0 or 100? Due to the wraparound effect, the lag difference is zero. That's because the lag gradient vertically shifts and when it wraps around, it realigns back to the way it was -- back to square one. At strobe phase 100 the strobe flash delayed by one frame, means the previous strobe flash and next strobe flash is also delayed one frame. You're back to square one. Consider the refresh cycle like an infinite loop. It's the same thing if you fly around planet Earth, cross the international Date zone, and land back here -- in an orbital rocket in less than 24 hours -- and it's still the same day if you land here at this same very location -- the wraparound effect. 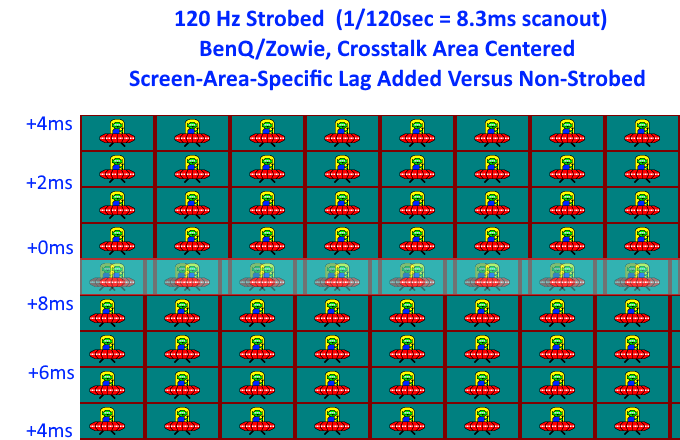 The latency is constant at the top edge and bottom edge of the crosstalk zone and the lag gradient "follows" the crosstalk zone, and the top/bottom edges wraps around to each other. Phase 0 and Phase 100 has a slight difference in crosstalk bar location so it really corresponds to roughly a 95% phase adjustment range, but the lag relative to crosstalk bar is exactly identical for all possible crosstalk bar positions, whether or not it's wrapping around to the opposite end of the screen. Basically the input lag 1 inch above the crosstalk bar is the same for all crosstalk (strobe phase) settings, regardless of the crosstalk bar position. Even though it shifts ahead/back by 1 frame in the simulation, the lag isn't shifting 1 frame ahead/back. In reality, the image is in motion so any shift forward is compensated by increasing lag. Eventually when crosstalk bar reaches near the bottom of screen, the lag of the top edge is now resembling the lag right underneath the crosstalk bar, so that 1 frame shift "ahead" is now cancelled out by 1 frame lag behind (see latency gradient diagram), resulting in same as before -- meaning crosstalk 0 and 100 has darn near the same lag. If this was photographed in absolute time, there would be no shift, but the shift is showing up in this animation simply because it's a simulation on a static image, rather than a scrolling image in motion. 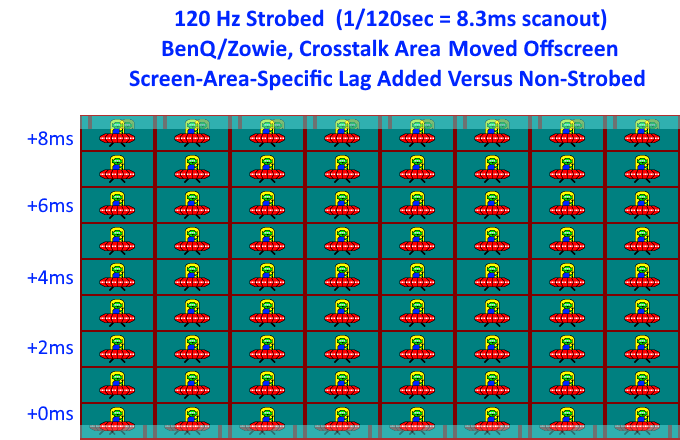 For more information about strobe latency with Crosstalk adjustments, see ANIMATIONS: Adjusting Strobe Phase & Crosstalk. Is it possible to reset the values set in this software? I just started dragging sliders on my Benq XL2546 without writing down original values.